After a particularly disappointing morning at church you can cheer yourself up with a glance at Gumbleton's and Greeley's thoughts on the Gospel of the day, which will nearly always make the homily you just heard seem good by comparison. Partly they annoy by using the Gospel as a means in the attainment of some polemical end; partly they annoy by the flaccid semi-Arian Jesus they present us with. Their Jesus turns out to be a rogue preacher with a truculent social agenda: a man, in fact, very much like themselves. "Maybe God is telling us that we need to change our focus from Jesus in the tabernacle onto Jesus in the tabernacle of our brothers and sisters. Because, my friends, ultimately where we reserve the blessed sacrament is no where near as important as to how we treat the blessed sacrament which is contained in the tabernacle of the people we encounter daily." On first reading this proposal might sound edifying ("as you have done to the least of my brethren, so you have done to me ..." [Mt 25:40]). But finding Jesus in our brothers and sisters is only edifying if Jesus himself is something extraordinary. When Mother Teresa said that Jesus was to be found "in the distressing guise of the poor" her confession had wallop. Why? Because she believed Jesus was God Incarnate, and to see God Incarnate as somehow present in a wretched man is to acknowledge that person as intrinsically worthy of reverence. But if you're a social Gospel christologist, to say you find Jesus in others is to say you can see in them the Jesus you yourself have found in the New Testament: a heterodox rabbi of first century Galilee. Sure, it's meant to be a compliment, but it doesn't shake you up, doesn't force you to confront, radically, the difference in the way you treat important and unimportant people. If Jesus is no big deal, finding Him in others is no big deal either. Now consider Eucharist adoration again. 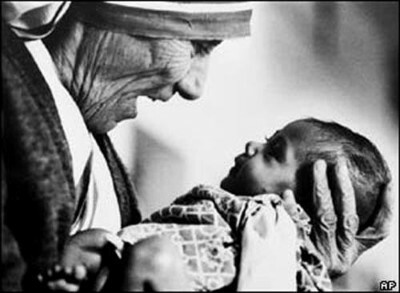 Mother Teresa regarded it a daily necessity if she and her sisters were to persevere in their work. On one hand, adoration reinforces one's faith that Jesus is God Incarnate, even as the belief itself summons the believer to adoration. But worshiping the body of Jesus under the species of bread also coaches us in a particular disconnect between appearance and reality, where the underlying reality is infinitely more precious than the surface appearance. Now it's comparatively easy to minister to poor people when they're cooperative and grateful and make the minister feel a sense of accomplishment. But sometimes, we're told, they're cantankerous to the point of being positively repellent. That's the point at which the self-congratulatory do-gooders quit and go home and where the real charity kicks in. That's the point at which it's impossible to see the face of Jesus in the destitute (or sick, or deranged) except as a pure act of faith. And that's the point at which it matters whether Jesus is divine or not, because belief in the repulsively disguised spark of divinity is the only reason to keep on giving love in exchange for contempt. When some human catastrophe (a famine, epidemic, earthquake) catches the public imagination, there's usually a noticeably widespread compassionate response -- noticeable, because (and as long as) the news crews have their cameras trained on the relief efforts. I don't intend to demean that spontaneous compassion, but I'm more impressed by the folks who remain, who stick with the wretched people in the wretched circumstances years after the media buzz has ended and everyone else has forgotten about it -- most especially when the virtuous and amiable poor have been sufficiently relieved and only the less virtuous or less amiable are left. The McCorrys would have us "change our focus from Jesus in the tabernacle onto Jesus in the tabernacle of our brothers and sisters." But I'd want to ask: who are the folks that in fact stick it for the long haul -- those who see adoration and charity as mutually exclusive alternatives, or those who see the first as a motive and a sustenance for the second? Copyright © 2007 Catholic Culture.